This summer my sister and her husband had a wedding celebration in my parent's backyard and brought along with them a Polaroid camera to capture some memories they could look at on their flight back home to Kansas City. They came across one at a thrift store and decided to buy some film and see what came of it. I was reading an article today about the history of Polaroid and I thought about making some searches for ideas to incorporate Polaroid into a fun wedding activity. 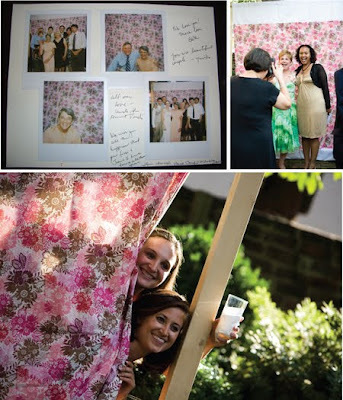 I had been thinking of some ideas about having a few Polaroid cameras for guests to play around with as opposed to having a photo booth (which I would kill to have at the reception, but know that it would be way too expensive). This will not be the last you hear about this.... How fun would it be to think of some prop ideas? And pick out a fabric for a back drop? Ohhh I'm excited.